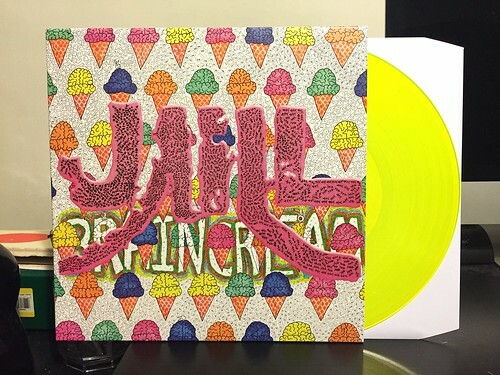 Ken from Dirtnap recommended Jaill to me quite a few years ago, when their album There's No Sky (Oh My My) was self released and they didn't have two L's in their name. I absolutely loved that album and was very happy for the band when they signed to Sub Pop for their next two albums. While I enjoyed both and don't really have anything bad to say about either, I was left with the feeling that these Jaill records just weren't quite as good as There's No Sky. After the Sub Pop excursion, we find Jaill on Burger records, the label that took There's No Sky from self released to non-self released. Jaill has come home also. Though they do not quite hit the highs they did three albums ago, they've made a remarkably consistent record that is the best thing they've done since. Brain Cream is full of crisp, jangly guitar, bouncy pop melodies and a light psychedelic sheen that adds to the overall vibe of the record. The psych influence never becomes overbearing or detracts from the pop. The band has also done a great job of adding some keyboard flourishes to a few songs that truly enhance the experience. A lot of times when a band starts dipping into that bag of tricks I get the feeling that they're adding layers to hide something. It never feels like Jaill is doing that on Brain Cream as the keys and atmospheric sounds give the album a rich full sound. Needless to say I really enjoy this album. Maybe it's not a balls to the wall catchy as There's No Sky, but it's a well crafted record with a handful of pretty great songs and it's easily the best thing they've done these last few albums.